Alpemix is a small application that lets you remotely connect to a computer to provide technical support, training or showcase a demo to your customers with file sharing capabilities. The program offers you an ID and password which you can send to the users you want to share your desktop with. Also, you will need to fill in the credentials of the users you’re trying to connect to as well. The generated ID and password is only valid for the current session and the next time you run Alpemix you will receive a new set. You can view the desktop of the computer you are connected to in a different window. You can also communicate via audio, as well as transfer files and folders. 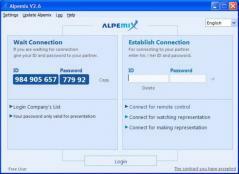 Alpemix also has instant messaging capabilities and you can set up a contact list.